-	Farm Trailers: Trailers used exclusively for transporting farm products to and from market or for transporting the personal property of the farmer for his own use on the farm. -	Equipment Trailers: Trailers with permanent mounted equipment such as a crane or well-drilling equipment. Trailer is not equipped for hauling supplies. -	Beginning in July 1, 2009, utility trailers that are designed for pulling behind an automobile or pickup truck are exempt from Alabama title laws. Such trailers remain subject to registration fees and taxes. 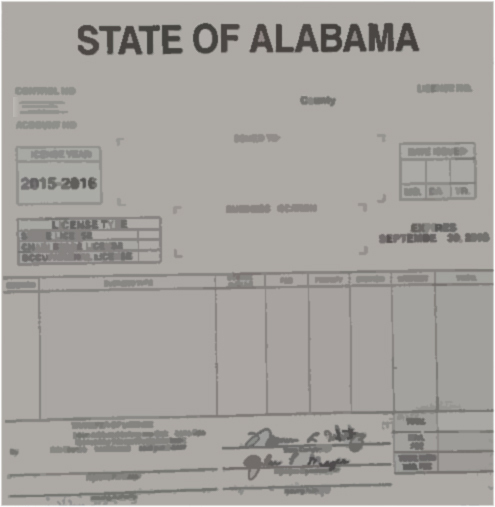 -	Beginning in January 1, 2012, any semitrailer, travel trailer, or gooseneck trailer more than twenty (20) model years old are exempt from Alabama title laws. Such trailers remain subject to registration fees and taxes. A sample of the necessary documents for title transfer for gooseneck and semitrailers is listed below. For additional information concerning registration and title provisions, you may wish to call the Motor Vehicle Division at (334)677-4734 or the Alabama Department of Revenue, Motor Vehicle Division.